Already LOVE Totally Target on Facebook! Thanks for the chance to win. I love your giveaways. Merry Christmas to you and all your followers!!! WOW! These look so cool! Keepin’ my fingers crossed! Funny thing today — there were people waithing outside the store early this morning before it opened. That’s a very, very nice giveaway! It’s a wishful thinking and hoping and keeping my fingers crossed for luck! Its time to pick me – thanks TT! Too cute- only dilemma is which one of my children to give the RC mouse to! a friend on FB also! “Like” Totally Target on Facebook! I could always use a Target gc! 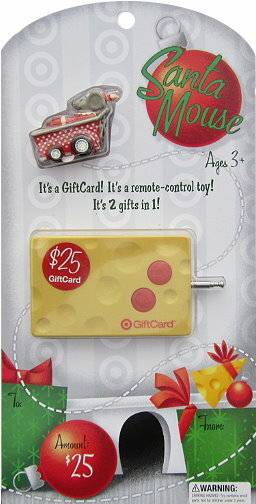 That gift card is TOO CUTE!!!!!!!!!!!!!!!!! Liked on Facebook! Love your site thanks so much! I only been using this website for a few weeks and I love! I get great deals thanks to you! Just went to Target today! Totally Target rocks as always. Have liked TT for a while!